Stu wrote: 20 x Scania diesel units are meant to be transferred from L to K towards the end of this month - possible timetable changes. So 9 end-of-life TRBs flushed out, and 11 extras? There must be a whole pile of new deliveries about to land at Leichhardt to allow for that! Once again - secure the driver and let people board through other doors to reduce the focus on the driver. At present, in the minds of these nuts the first thing they see on boarding the bus is an authority figure right in front of them like a sitting duck. The article states the attacker was already aboard the bus, and ran from the back to attack the driver. Doesn't sound like an issue with a bus being at-capacity, or with what door(s) passengers are boarding through. Putting the driver in a sealed box, cage (or otherwise) implies there is a societal issue that isn't being controlled. Additionally, it sends the message to boarding passengers that their service is unsafe. That's not to say safety precautions are unnecessary, but it seems we have the wrong solutions for these problems. The "societal problem" is a couple of hundred thousand or so ferals on welfare, drugs and booze who have no sense of responsibility to society. That's a lot of cages compared with a couple of hundred for the buses. Well there is a societal issue that isn't being controlled! Image-wise there's really nothing different between enclosing a bus driver in a cab from a tram or train driver who are already enclosed. It's just applying the same principle across all modes. It's pretty-well already done on Perth isn't it?! The old days of direct driver interaction with passengers in cities at least should be coming to a close, for the safety of drivers more than anything. Cities in Australia are becoming dumps these days compared to what they once were. It's just part of reality (like it or not!) that people who previously didn't need protection such as bus drivers, now do and the industry should act appropriately. Sexton's Paterson 4241MO OH1830 M B is now based at Rutherford and has been since July 2018,for a school service in the Maitland area,anyone where it is based? If we enclose the bus driver we might end up with more copycat attacks like the driver that was burned alive in his volgren scania in Brisbane. Yet another monotonously typical rail fail today at the bottom end of the south coast line. The 1600 railcar ex Kiama failed to proceed beyond Berry and dumped about 70 passengers there, 10 minutes short of their destination. Over 80 people were waiting for the train that never came at Bomaderry. Three buses were dispatched from Premier Illawarra in Wollongong and everybody had to wait till they got to Nowra (why not Nowra Coaches I don't know). The three buses expressed to Nowra, BYPASSING the passengers stranded at Berry and collected the northbound crowd at Bomaderry about 45 minutes late. Then another bus from an unidentified operator was sent to pick up the Berry strandees and delivered them to Bomaderry over 50 minutes late. I guess the bus operators did the best they could as instructed but the railway staff struggle. I was relaying advice from my daughter, who was ringing me from Berry, to update the Bomaderry station staff on what was happening with the bus at Berry as they couldn't find out themselves. TV 8788 belongs to Shellharbour City Tour Coaches,owned by Wayne Green. Certaintly a weird way of doing the replacements,Tony.You would think a phone call to Nowra Coaches,Shoalbus ,Kennedys would produce a far quicker replacement response time. And you wonder passengers would prefer to use their own cars !! The amusing thing is that the station staff adopted the high-tech approach to locating buses of standing out in Meroo St looking northwards, seeing if they could see the buses approaching. They were holding onto some sophisticated-looking mobile phone that I assume was some sort of internal communication device out of which the words "I dunno" could be heard. Onya NSW Railways, how the mighty have fallen. Perhaps if the passenger loading had been a bit lighter, they could have summonsed some vehicles from the very conveniently located constabulary there at Bomaderry. Bringing the cops in for angry crowd control? The cops are in town on the other side of the river and the other day I saw no less than two HWP vehicles in the McDonalds carpark. As burrumbus suggested, there are four bus companies in town, one with a depot just up the road from the station. Perhaps Premier has a contract of some sort, but Premier is located in Nowra as well as Wollongong. Perhaps the Wollongong depot is the contact centre for emergency bus replacements; they would take the booking to prevent other companies getting the work, but Trainlink would have no idea where the buses were actually coming from. tonyp wrote: The cops are in town on the other side of the river and the other day I saw no less than two HWP vehicles in the McDonalds carpark. What's with the illuminated Police sign in the background of the first Irizar photo? Is the station some kind of base for the PTC (Police Transport Command)? It seems odd to have that sign there if it's not a police station that the public can attend. Bit like if an administrative office for McDonald's had a big illumated golden arches sign out the front. BroadGauge wrote: Perhaps if the passenger loading had been a bit lighter, they could have summonsed some vehicles from the very conveniently located constabulary there at Bomaderry. BroadGauge wrote: What's with the illuminated Police sign in the background of the first Irizar photo? Is the station some kind of base for the PTC (Police Transport Command)? I must say I've never thought much about that. Perhaps they have a room or compound in the railway station for their use when required. 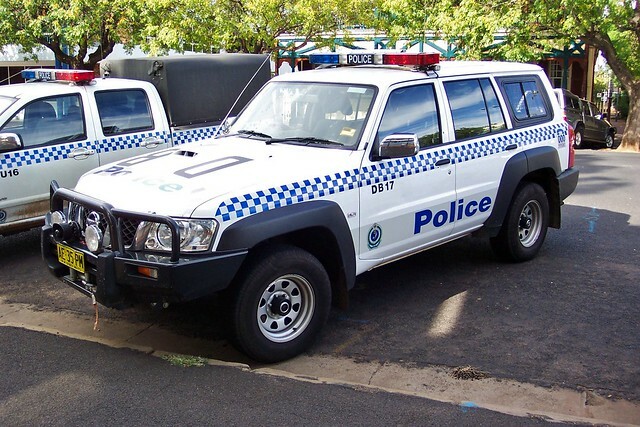 Unmanned police facilties are common in regional areas. There are a few railway stations around that have this signage, Presumably they are bases for the PTC and other police could use them in the event of a major incident. I think a number of these routes had running time changes on some trips back in December. ^ Yes, it would appear that 493 has had some time added to the last trip from Rockdale and o also forgot that 406 had a date ninot changes to Saturday trip a few year ago. The other routes have had no changes. Stu wrote: ^ Yes, it would appear that 493 has had some time added to the last trip from Rockdale and o also forgot that 406 had a date ninot changes to Saturday trip a few year ago. The other routes have had no changes. I'd be fairly sure that Routes 406, 487, 490, 491 & 492 all had some running time and/or departure time changes back in December, mostly in weekday peak hours. ^ I have compared the current timetables with some older versions. There was a website that used to display versions and dates of timetables issued although I cannot find it. - 473 current timetable is the same as the original from 20/03/2010. - 487 current timetable is the same as the original from 20/03/2010. - 490 current timetable is the same as previous versions 20/03/2010; July 2011 (Hurstville Interchange upgrade) & 07/06/2015 (re-route via Clemton Park). trial for extending some existing services to and from Scalibrini Village). * No additional running times or additional trips. On time running for 490 & 492 (excluding Christmas & New Year holidays) is woeful during the AM & PM peaks respectively, the band air solution has been to change the sifts during large timetable changes (for other routes), operational changes (single depot or multi-depot / regional approach) or changing only a handful of shifts at depot level. Stu wrote: ^ I have compared the current timetables with some older versions. There was a website that used to display versions and dates of timetables issued although I cannot find it. • 490 - PM peak trips ex Drummoyne, starting with the previous 16:13 now depart earlier and arrive Hurstville later. • 492 - PM peak trips ex Drummoyne, now depart earlier and/or arrive Rockdale later.